A few months ago I tried Greek yogurt for the first time. I was afraid to try it at first but found out quickly that I really liked it. I found Yoplait Greek yogurt to be rich, creamy and oh so tasty. Not only is Yoplait Greek yogurt high in protein and lower in carbohydrates but now it is only 100 calories per serving, WELCOME YOPLAIT GREEK 100! Yoplait Greek 100 is available in six delicious flavors including Strawberry, Black Cherry, Mixed Berry, Vanilla, Peach and Key Lime. 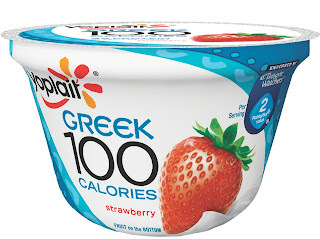 Not only is it only 100 calories per serving, Yoplait Greek 100 is the only Greek yogurt endorsed by Weight Watchers®. As part of my review, I had the pleasure of trying the vanilla and black cherry (one of my favorite flavors!) and found them to be full of flavor and a great snack for any time of day. They can satisfy the mid-afternoon sweet tooth attack and afterwards I do not feel guilty for indulging. This entry was posted in Giveaways, Reviews by Carrie. Bookmark the permalink. I would like to try the Peach first. I want to try Lime first. I would love to try the peach flavor! I’d like to try the Black Cherry first! Key Lime would be my flavor of choice! Id love to try peach. I would love to try the Peach flavor first. I really want to try the Peach first! 🙂 Thank you. I’d like to try the Key Lime flavor. I’d like to try key lime. Thanks for the giveaway. I would like to try black cherry first. Black Cherry would be my first choice. I would try peach first! Strawberry would be my first choice. I’d love to try the Mixed Berry – thank you. The Mixed Berry is my choice! I would try the strawberry first. I want to try the key lime. I want to try Black Cherry. I would like to try Mixed Berry. I want to try the Black Cherry!